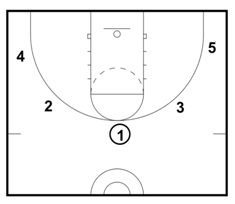 A 5 out offense is a half court set that places all five of your players on the perimeter. The name "open post" comes from the absence of players around the elbows or blocks. The goal is to spread out the defense and attack from the perimeter, by putting at least four or (ideally) five players on the court who are proficient at both handling and shooting the ball from behind the arc. This will pull the defense out of the paint, allowing you to create high percentage looks at the basket via penetration, and quality three point shots when the defense is forced to collapse to prevent that penetration. You’ll need smaller, mobile bigs, as this type of offense will generally lead to more transition opportunities, both on offense and defense. But there are some tradeoffs to consider. If you decide to “go small” – you may have a tougher time defending larger post players, as well as securing rebounds on the offensive and defensive sides of the ball. Generally, this type of offense is conducive to a faster paced team that likes to get after the ball on defense and push out in transition whenever they have the opportunity. Whether you’ve got the personnel to run a 5 out offense regularly, or just like to use it as a change of pace, this scheme can be extremely effective when used in the right situations. Below, you’ll a great sample play for the 5 Out Offense. 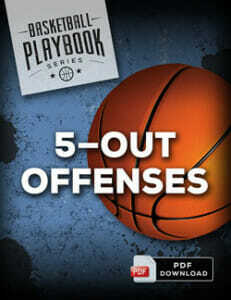 If you’re interested in seeing more, make sure to download the complete 5 Out Offenses PDF Playbook. We’ll begin with a set that puts our wings down in the corners. Both bigs come up past the three point line, each roughly above the left and right lane lines extended. 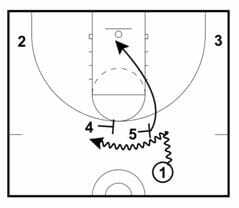 The bigs will set a staggered double ball screen for the point guard. If the lane is open, he can turn the corner and attack the basket. After the screens, one of the bigs will dive and the other will spot up near the three point line. If you're working with younger players, you can automatically send the 5 to dive and the 4 to spot up. If you're working with more experienced players, allow the bigs to read the defense and react. Whoever’s man is in worse position to defend a hard roll to the hoop should be the one rolling. 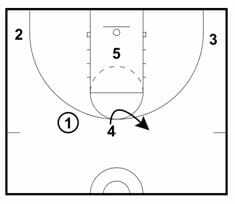 Most of the time it will be the first screener, but once you’ve run this play a couple times, you’ll find the defense may adjust. If the point guard can hit the roller, who is the center in this example, he will, but otherwise we want him to swing it back to the four man up top. The center should be working hard in the paint to establish deep post position, and we want our power forward to make the high low pass if it’s available. If the screener’s defender jumps out early to switch or hedge on the ballhandler, the screener should “slip” the screen – making a hard cut to the basket and looking for a quick entry pass. On the high low post up, the 4-man should practice faking a high pass, then stepping around his defender and deliver a low bounce pass. 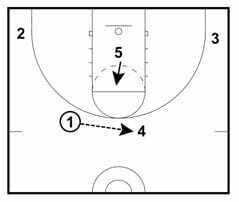 The 5-man will need to work quickly inside to avoid a 3-second call. Make sure he stays low, sits on his defender’s knee and shows a good target for the passer. The shooting guard and small forward should be spotting up in the corners. If their defenders collapse into the middle to help on the rolling big man they should be wide open for a catch and shoot three. There are a few more pretty cool options off this basic set, including a “stacked” screen (instead of a staggered screen). And some different variations and options to get the 2 and 3 more involved. You can find them all (and many more) inside the complete 5 Out Offenses PDF playbook. 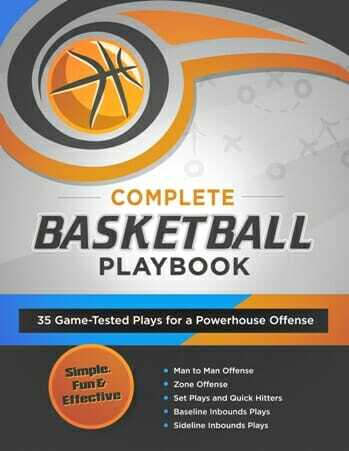 It’s jam-packed with 14 game-tested plays to spread the floor, get more easy layups and wide open threes for your team. 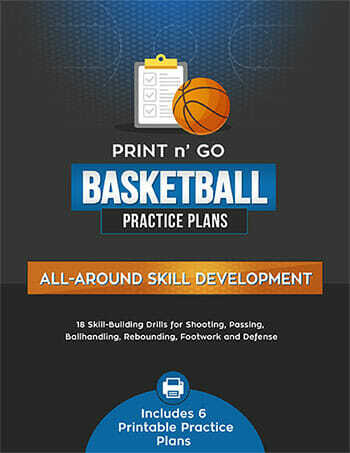 For a limited time, you’ll also receive a free eBook called “Practice Drills for Up-Tempo Basketball” – filled with 29 fun and effective drills to help your team master the up-tempo style of play. I really enjoy your information. 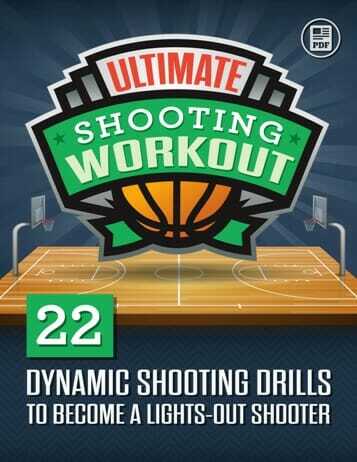 It helps enhance what I’m already doing for my AAU team.